Wrightsville Beach is one of the Cape Fear region’s favorite vacation hot spots, and as a result, it’s a popular destination for campers and RV explorers who want to discover everything that this town and area has to offer. While there are no campgrounds or RV parks directly within the town limits, visitors who are staying at a local camping or RV resort will have no problem accessing the shoreline. Many area campgrounds are located just a few miles from the beaches, or may be in attractive neighboring beach communities – like Carolina Beach – where there’s plenty of fun and sun to go around. Launch on a camping adventure that your family will never forget by checking out the regional camping scene that covers virtually every corner of the Cape Fear area, and which can accommodate visitors of all camping styles. Visitors can start their camping adventure by checking out these local resorts and campgrounds that are a relatively easy drive away from the Wrightsville Beach shoreline, and which offer a wealth of amenities besides the basics. With full-hook up sites, pretty settings along the waterfront, a resort full of amenities to make every day entertaining, and / or all of the above, having a blast is a breeze when campers opt to stay in the Cape Fear area, close to Wrightsville Beach. Located just inland and slightly north of Wrightsville Beach, the Wilmington KOA features about 100 sites which includes both tent and RV accommodations. Amenities within the extensive resort-style campground include individual sites with 50 amp power, sewer, and cable TV hookups, wireless internet, and community facilities that include a seasonal swimming pool, picnic pavilion, a “Kamping Kitchen,” and available firewood and propane. Located just south of Wrightsville Beach and arguably one of the most popular campgrounds in the region, Carolina Beach State Park boasts about 100 sites for tent and RV campers alike. The extensive list of community amenities includes 83 sites which includes hook-up sites with water, sewer, and 50 amp electric service, a network of hiking trails, a boat launch / ramp, picnic areas, a visitor’s center, and an on-site beach. This family-friendly campground that’s also located in Carolina Beach has roughly 100 sites which can accommodate tent and / or RV campers, and which feature sewer, electric, and water hook-ups, as well as cable TV and free Wi-Fi. Additional amenities for campers include a seasonal swimming pool with an adjacent area for sunbathing, a large bathhouse, laundry facilities, a general store, and neighboring riverfront parks. This public park which is one of the few regions in the area that welcomes 4WD vehicles comprises of an isolated parcel of shoreline just north of Carolina Beach, which doubles as rustic – but undeniably scenic – camping grounds. The sites have few to no amenities, but are close to the public beach accesses, public restrooms, and other amenities that are available during the height of the summer season. Located south of Wrightsville Beach in picturesque Carolina Beach, this campground features just 21 spaces for RV campers with full hook-ups that include 30 / 50 amp electric service, cable TV, and wireless internet access. The campground also features an on-site boat or RV storage area, as well as walking-distance access to area beaches. Located roughly 25 miles north of Wrightsville Beach in the small town of Hampstead, this campground is a smaller destination with just 20 sites that feature electric, water, and sewer hook-ups, and which can accommodate both tent campers as well as RV guests. Located along Crooked Creek Trail as well as the waterfront, this campground is a quiet destination where campers and their pets are both welcome. 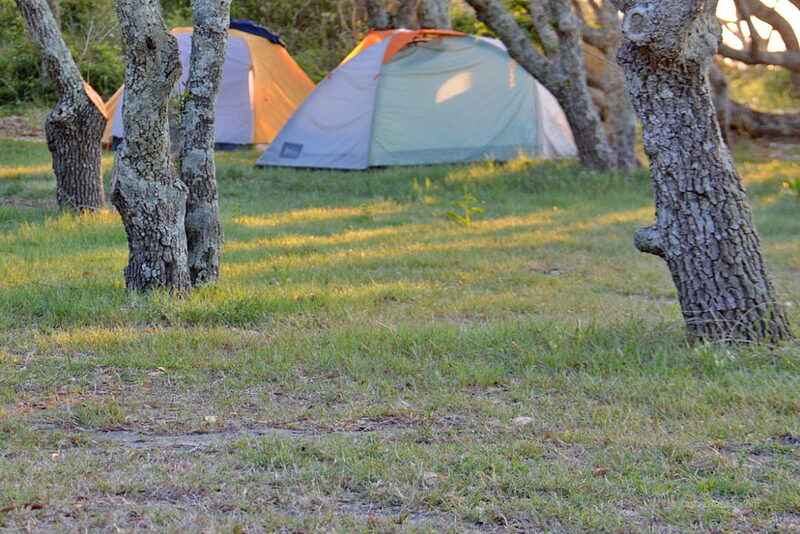 Because the coastal climate of the Cape Fear area is moderately warm all year-round, virtually any time of year can be conducive for a camping adventure. Many local campgrounds are open year-round, which makes them attractive destinations even in the winter months, and a number may even offer lower rates in the off-season. With that being said, some campgrounds may be seasonally closed from November until early March, and / or may offer amenities that are only available for warm weather visitors, which includes outdoor swimming pools, beach equipment, and community programs and / or organized activities. Consult the individual campground to see what amenities are available, as well as seasonal hours of operation, if you are planning a wintertime visit. Campers will want to watch for temperature fluctuations as well, which can make a stay unduly hot or cold. While the wintertime temps in the Wrightsville Beach area generally hover around 50 degrees, the Cape Fear region is susceptible to cold snaps and even freezes, which means that portable heaters and other equipment may come in handy. Conversely, the sea breezes typically keep the area generally cool on summer nights, however, the area can have some hot days in June, July and August, with local temperatures reaching 90 degrees or more. Look for shaded campsites that are close to the water, (and there are plenty to choose from), to avoid a summer heat wave and to enjoy a cool coastal breeze. One weather-related factor that campers will definitely want to keep an eye out for are the seasonal hurricanes and tropical storms. The hurricane season is officially from July until November, and while it’s rare for Wrightsville Beach and the Cape Fear area to be in the direct path of a hurricane, a passing storm can cause flooding in low-lying areas, as well as heavy rains and winds. Use caution when booking a camping vacation during the height of hurricane season, (generally August through October), and follow evacuation orders as needed to stay safe if bad weather arrives. Because many of the area campgrounds are located in pretty wooded areas that are near the water, bug spray will come in very handy for campers. Make sure you have plenty on hand – as well as sunscreen – to ensure a great time, inside and out. Several local campgrounds, like the Wilmington KOA and the Carolina Beach State Park, may have special on-site activities for campers, such as kids’ programs, guided kayaking or hiking trips, family nights, bonfires, and more. Check local events calendars ahead of time to see what activities correspond with a summertime stay. Book as far in advance as possible, especially if your camping trip is scheduled for the summer, or lands on an “event” weekend, like the Wilmington Riverfest or the Azalea Festival. During these busy times, spots at popular campgrounds, like Carolina Beach State Park, can fill up quickly. Want a long-term spot by the beach? The area is home to several mobile home parks that can accommodate RV campers on a monthly or annual basis, making it easy to enjoy the beach life year-round. Don’t forget to bring the boat or kayak along! Many of the area campgrounds have on-site or easy access to local public boat ramps, which makes it easy to get out on the water and have some fun. With a collection of destinations that are a short drive away from the Wrightsville Beach shoreline, it’s easy to enjoy everything this town has to offer by booking a spot at a local campground. Discover some of the region’s favorite destinations for a rustic coastal adventure, and enjoy a Cape Fear and Wrightsville Beach area adventure that your family will never forget.